Stirring Trouble Internationally: With The Economy Sinking Could It Be That George Osborne Is Missing Something? With The Economy Sinking Could It Be That George Osborne Is Missing Something? 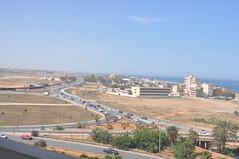 Foreign Office tells Britons in Benghazi to flee for their lives. Democracy in Libya has never been more apparent.Ben Delicious reports from Tripoli about people living in the area who might be at risks of growing terrorism. The common knowledge shared between British Foreign Office and politicians is now public knowledge. The news from Benghazi has caused a bit of a stir in Libya terrorism is a growing problem and Tony Blair has announced some things too. This is not new news to Britain last year some awful things happened to the US Ambassador so this recent announcement is no surprise, the threats are real and they have been for some time. Ben looks at the hard truth of what happened to the officials last year and also reports some things you might want to be reminded about in the State Department. Spokeswomen Secretary of State Hillary Clinton made an interesting speech about Benghazi and North Africa recently and Ben picks up where Hilary left of. Then the West, David Cameron with William Hague have a lot of things to discuss about these matters. The Arab Spring and Syria in the West are protecting and supporting some interesting people just in case you do not know you can find more about over on Stirring Trouble Internationally. Benghazi has created all kinds of questions the Arab Spring are discussing Benghazi, the Foreign and Commonwealth Office are asking a lot of questions about the risks around the world to its residents. Hillary Rodham Clinton is also joining in the conversation. Libya and the United States, democracies and historical explanations of the Western world and why William Hague will have to take another look at the foreign Benghazi office.